I think every nook and cranny is now decked out for the holidays and ready for entertaining or just a night of TV, a fire and popcorn. Perhaps you might recognize some vintage Thimbleberries runners and quilts here and there. Because I have so many, I don’t always have a chance to use them all every year but it is fun to pull out different ones and use them in different or atypical ways. This is the view as you enter our front door. The quilt on the back of the couch was featured in Love of Quilting by Fons & Porter a few yeas ago. The black accents blend nicely with other black items in the room, as the pillows I made from a Moda holly print a few years back and balances the black granite surround on the fireplace. 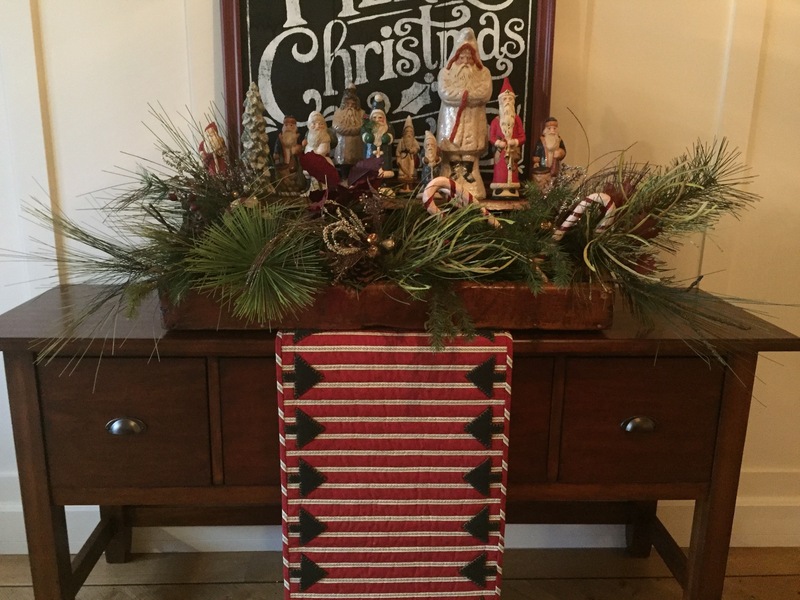 I have also been using table runners on tables or sideboards hanging vertically over the side edge as I did here on the sideboard in the front entrance….a whole new way of viewing a table runner. My chalkware Santa collection is at home on this unusual antique tool box. Half the lid flips open to the interior space for (tools) or greenery in this case. 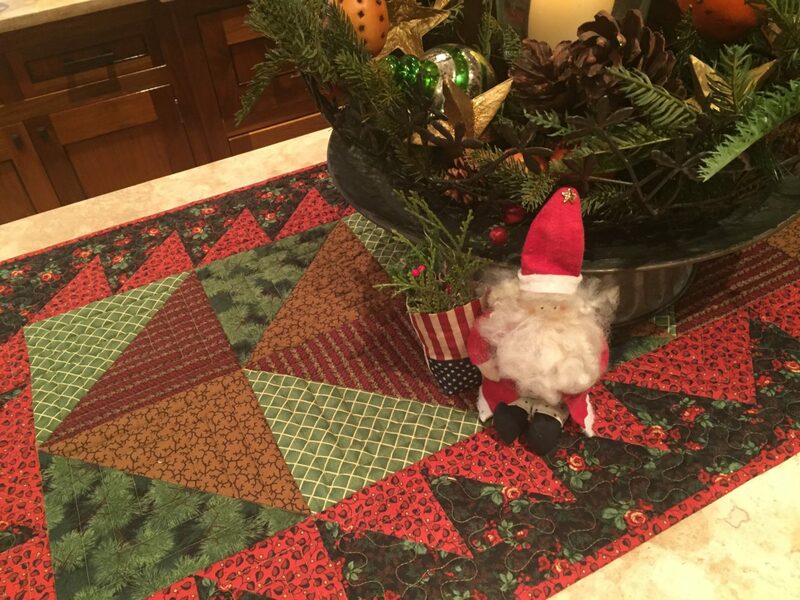 It also creates a flat surface for the Santa display. The Merry Christmas sign was a find last year at Pottery Barn. This sign ties the entrance into the living space with the simple use of the color black. The island runner is the Cottage Runner from the Thimbleberries Pine and Rose Cottage project book. It is a nice big runner for my large island. When I need the runner for serving a large buffet, I turn it vertically on the island and use it and the arrangement as a centerpiece with the addition of a few candles. 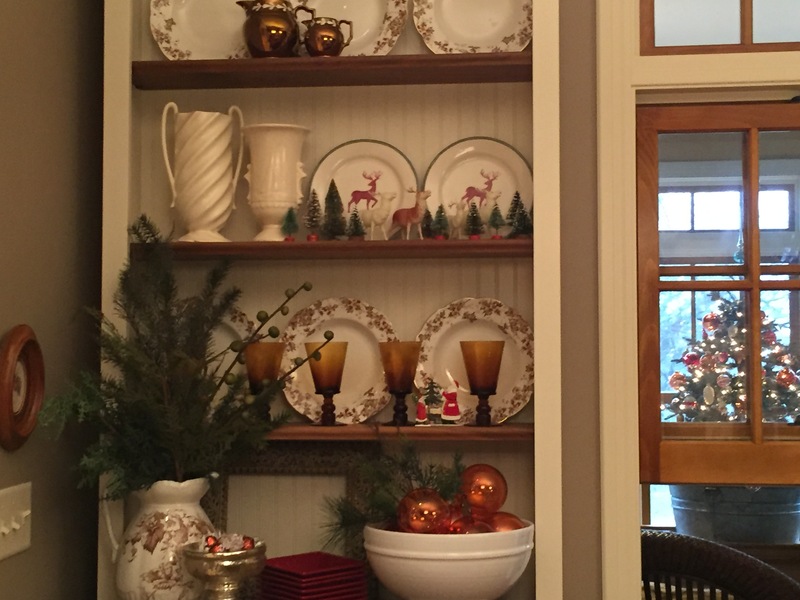 My china storage piece in the dining room fills one whole wall and is 5-1/2′ tall which creates a great space for decorating because it is too high to use for serving. My approach is always to layer, layer and then layer some more, creating groupings rather that using items individually. And, as you can see behind the glass doors of the cupboard, I group items by color for a more massive visual impact. The following are other spots around the house that have been decked out. It is a fun time of the year to over-do. Here, wax tree candles and a celluloid reindeer are nestled in an apothecary jar. I used Epson salts at the base in the jar for a “snow”vignette on my kitchen counter. 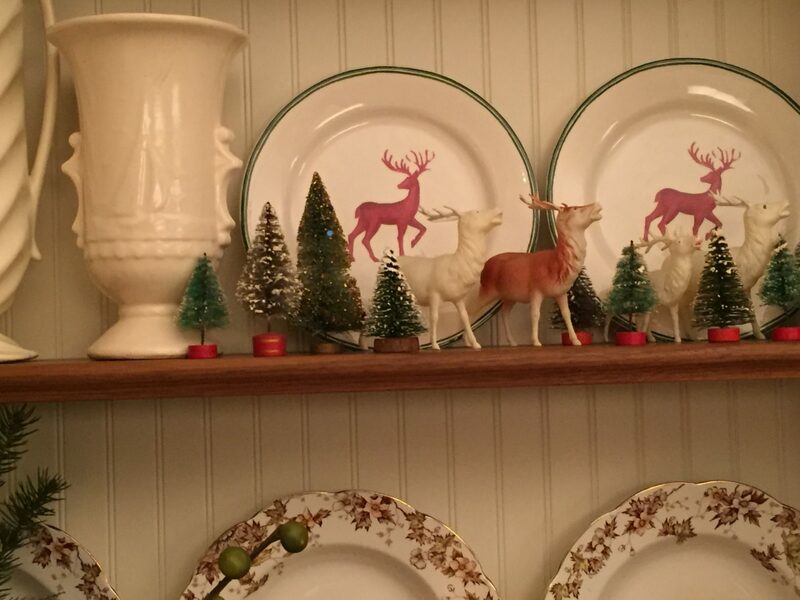 More antique celluloid reindeer displayed with reindeer plates and vintage bottle brush trees. 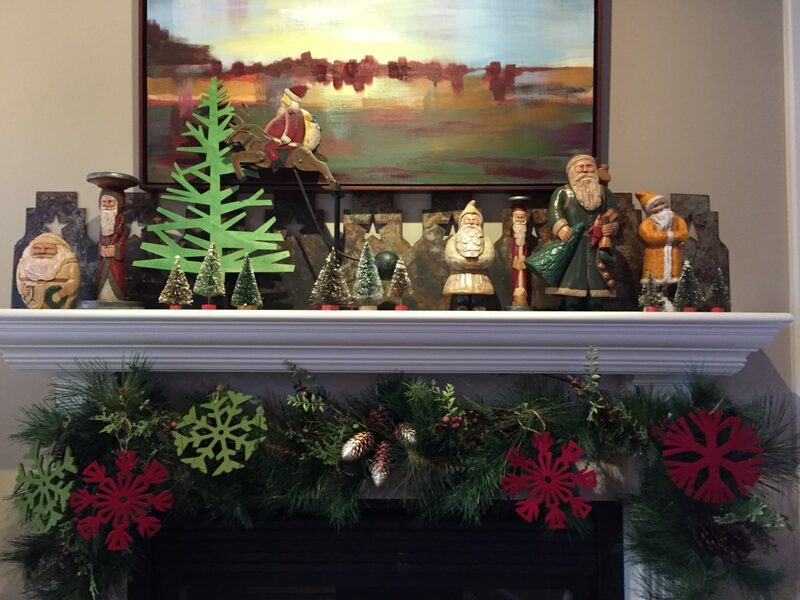 Sitting room fireplace mantle with carved wooded folk art Santas. 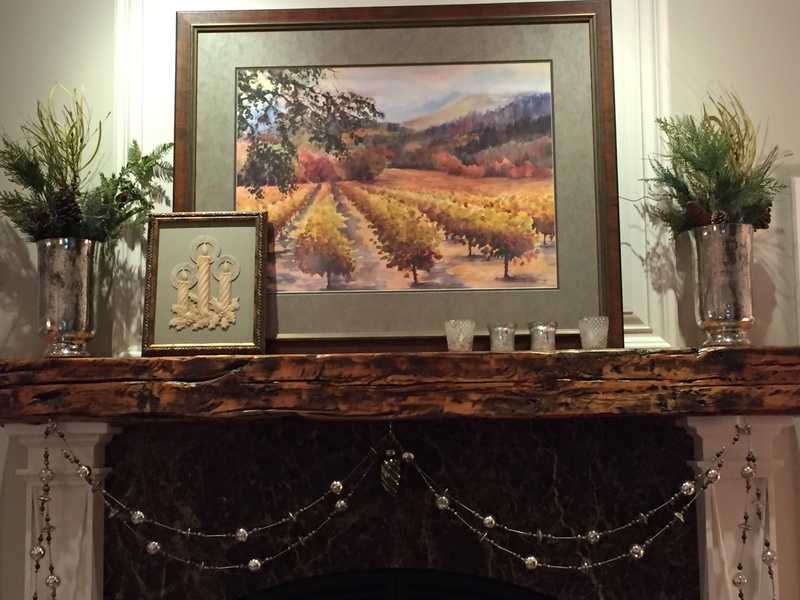 Living room fireplace mantle with mercury glass accessories. 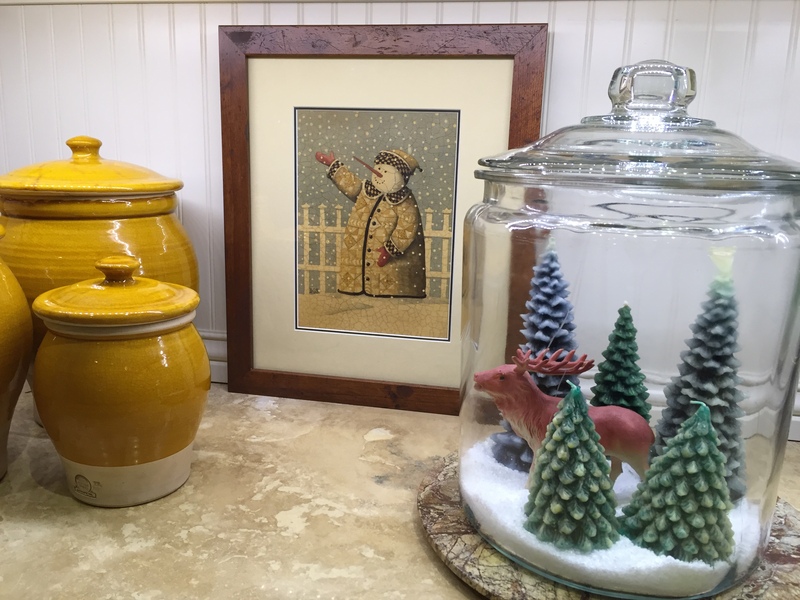 The small picture resting against the larger picture is a framed antique German die cut ornament. It is a nice way to preserve the paper ornament and a good way to display it. Glitter houses made with cardboard house forms, Mod Podge and glitter. I like Martha Stewart’s assortment of glitter. This silver and brass combo blends nicely with my antique Christmas collectables. When I run out of Mod Podge, I use a mixture of 1/2 white glue (like Elmer’s) and half water. 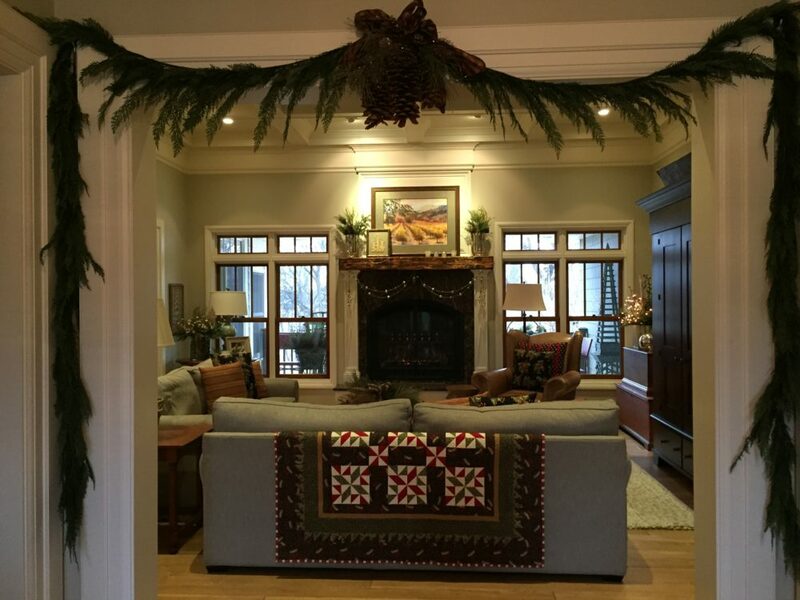 Winter Scape wall quilt mounted with double stick carpet tape on a large square of framed ceiling tin. It is a kit that is now available from the Thimbleberries Project of the Month collection for Fons and Porter. This is a small project that you really could still get made either for your own decorating and gifts. Here the Mitten, Mitten Table Runner is used on the back of a couch that is visible from my dining room. Truly a long time favorite of mine. The pattern for the project is in You’re Invited which is available from Landauer Publishing. It is another way to use a runner other than on a table. 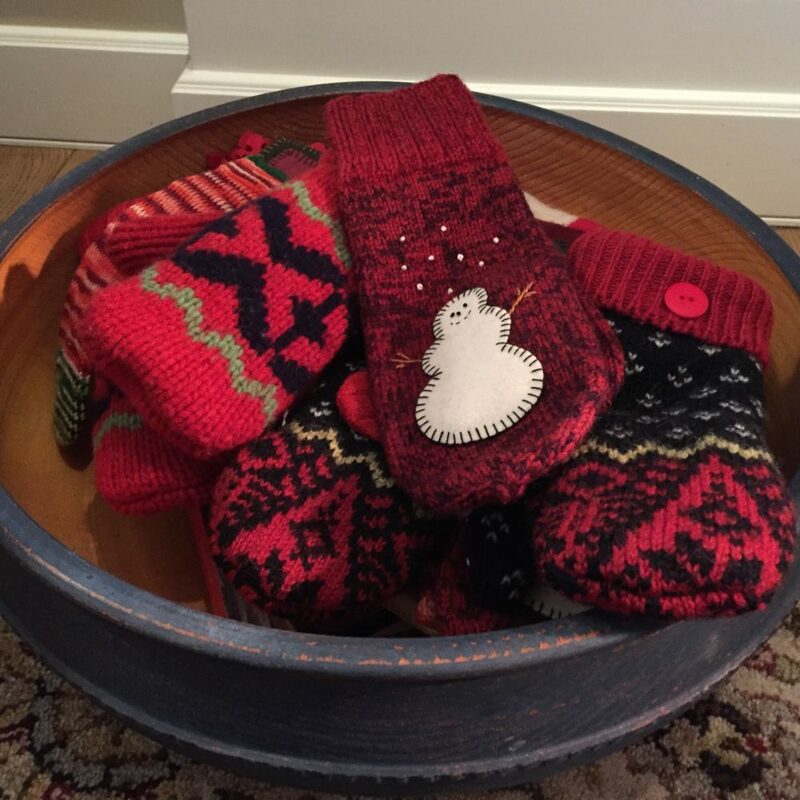 All of my red mittens, vintage and new, have found their way into “big blue”…the wonderful hand turned large wooden bowl on the floor in front of our fireplace in the sitting room. Watch for more decorating and gift ideas next week. Enjoy “fussing up” your house with all of your treasures. It is time for me to stop….the house is full. Re: your cookie brittle recipe I found this recipe on the back of chocolate chip pkg. back in 1969 and have not seen it since. It’s been a favorite with my family since then. so beautiful! 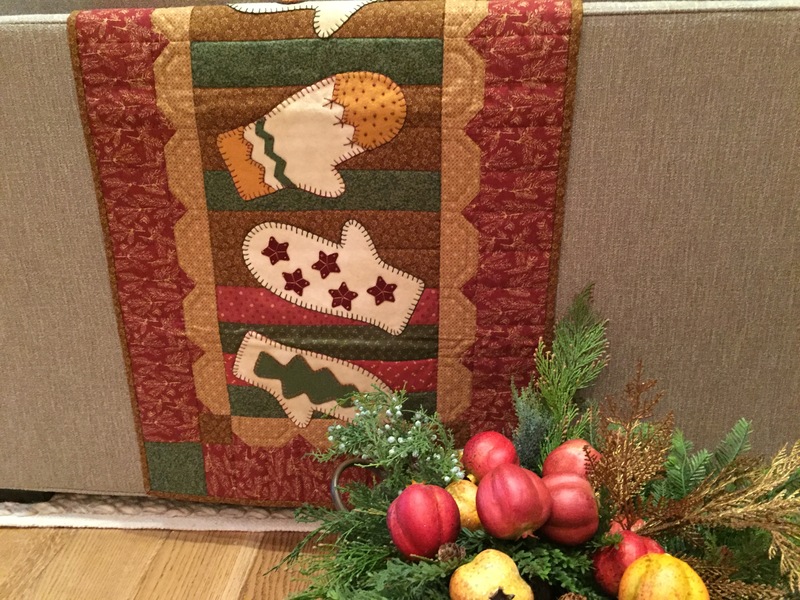 more pictures please and do you add quilts to your kitchen? I don’t really have any free wall space for wall quilts, so I only use large runners on my island and I really have many to choose from so change out often. Your home looks so delightful and inviting! Do you happen to know the overall quilting pattern/pantograph name that was used on the Painted Daisy quilt earlier this year? It is a very appealing design and I’d like to purchase the software for the design, or tell a long arm quilter which one I want. I quilt small quilts on my sewing machine, but not bed-size ones. Best wishes for a very merry Christmas for you and your family! I didn’t make a note of the name, but if you show the picture from the blog to your long arm quilter, I know she would be able to get close to it or find it for you. Just finished “Vintage Stitches”, can you recommend a quilting design. Difficult to quilt on a two-sided quilt. We used an all-over machine quilting design on our studio sample that was quilted by a long arm quilter. If you are hand quilting it or quilting it on your home machine, I would suggest the same, like a traditional hanging diamonds pattern or cross-hatching which has always been my “go to” all-over design and would be perfect for this two sided quilt. These designs add dimension and enhance the quilt and will go with both sides. Congratulations on finishing a really big project. Thank you. I quilt on my home machine. I have enjoyed making your quilts designs and using the RJR fabrics. Completed Circle of Love plus all the projects included in the book; 3′ Company; and now Vintage Stitches. I am dedicated to finishing all my UFO projects. In one year, I have completed 25. Love to quilt and give to family and friends. This is a very impressive and ambitious list. Congratulations! Lynette…. You make everything look so homey and cozy! I always gleen something from your posts. Thank you for taking the time to share your decorating with others! Question….is the woodwork in your home white or a cream color? It looks so NICE! The woodwork is painted a cream color…however, more towards white than yellow. The color (now 9 years ago) was Linen by Ralph Lauren. I had it matched to a Benjamin Moore satin base. I have been very pleased with it. Everything looks beautiful and comfortable for family! Love the different ways you are using table runners in your decorating. Mounting the applique on a ceiling tile is so unique and elegant! 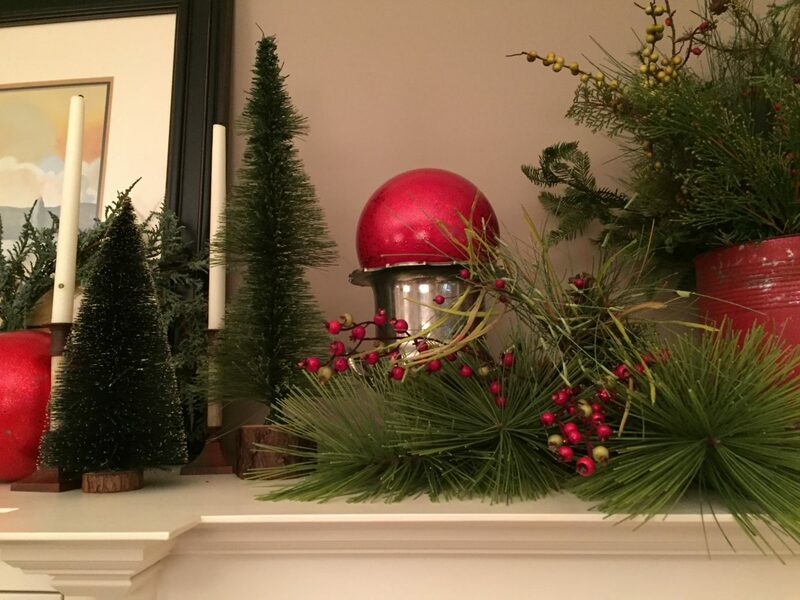 Thanks for sharing your decorating ideas. I am decorating on Tues. and you have inspired me. I know…sometimes it just takes a little nudge to get inspired. Have fun and enjoy the holidays. There isn’t room here for me to tell you how much I enjoyed this post! You have such a talent for knowing what to put where. I’m surprised that a magazine like Country Living hasn’t called you up yet to feature your home in their magazine!! Luckily for us, you write this blog so we can enjoy seeing all of your many talents. Your home is just beautiful!!!!! 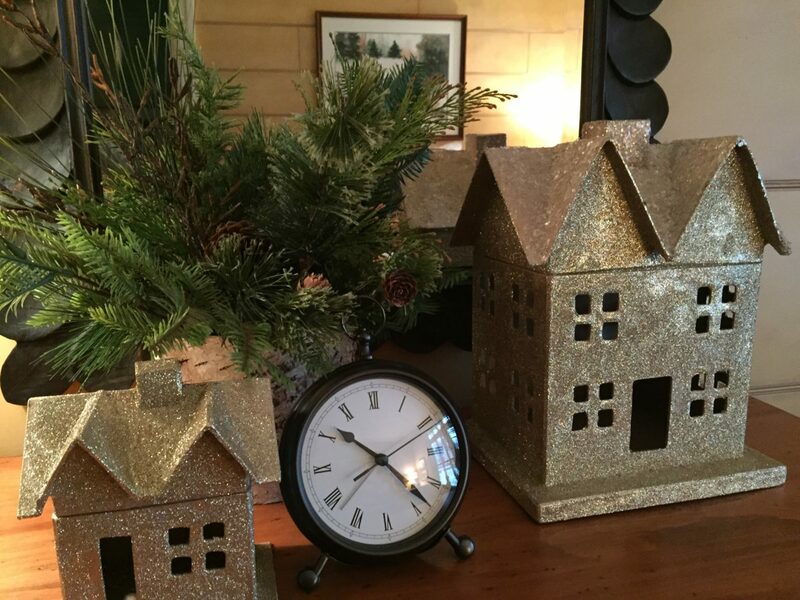 What a beautiful home and I love all your Christmas display ideas. i am now going to display some of my table runners vertically. Thank you for sharing your great ideas. Some of my favorite parts of all your books is seeing your beautifully styled home and your fun collections. 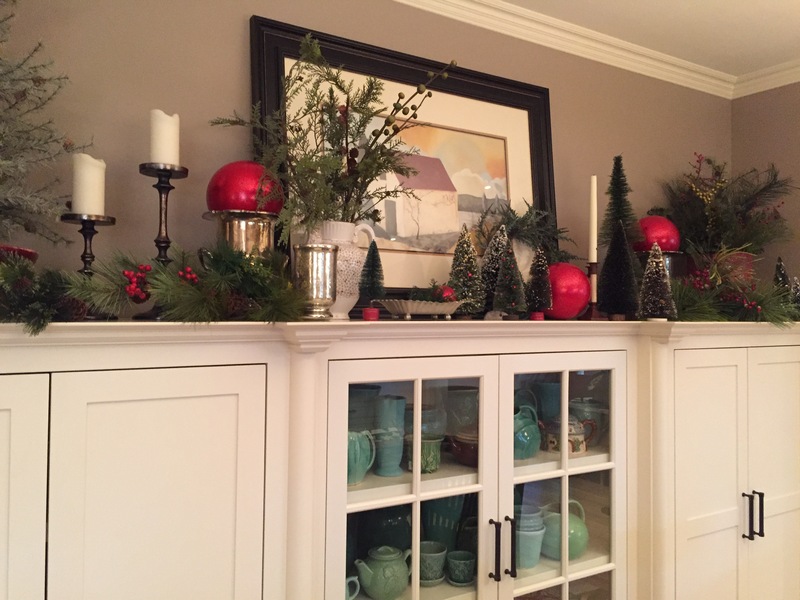 Thanks for sharing your decorating for this year–I am even a little motivated to start doing some of my own–lol! Thank you so much for sharing. I love the warm, inviting look you have created. It is home that looks like a big hug. 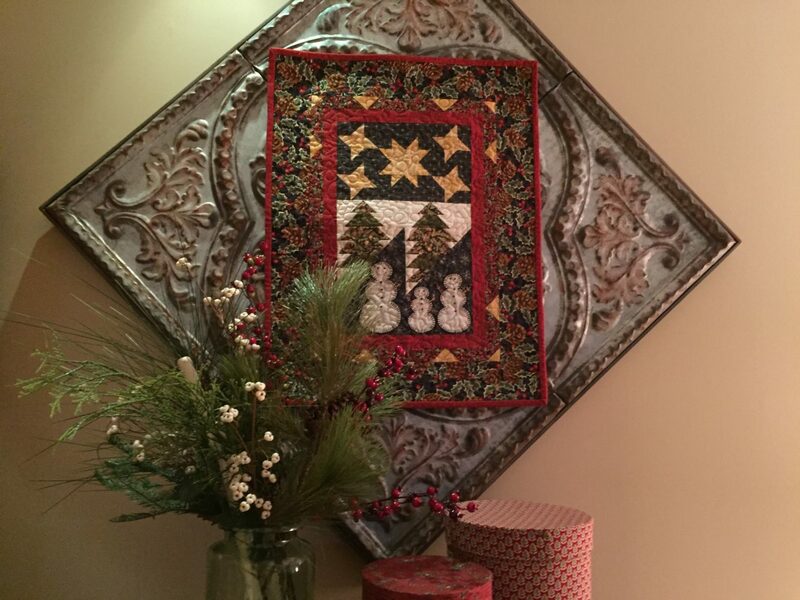 You are so talented at decorating as well as quilting…..I have decorated with several of my thimbleberries quilts, too. Absolutely delightful! Thank you for sharing. Have a wonderful Christmas.